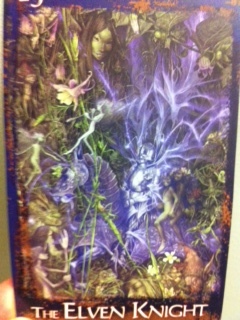 Card: 15 The Elven Knight – from The Heart of Faerie Oracle deck by Brian and Wendy Froud. Message from the Fairies: We have mentioned more than once that our realm is actually superimposed upon your realm, and we experience both your realm and our simultaneously. We know that most of you are only experiencing your three dimensional reality, but some of you occasionally get glimpses into our realm. That’s why some of you can or have seen us. We would like to reiterate that we would never do anything against your free will, and we most certainly would not persuade you into coming into our realm unless you really wanted us to. Also, you would never be trapped in our realm because you always have free will. Always!!! We really want to reiterate this to you again and again. You have free will. You have free will. You have free will. The more you truly understand this on a deep level, the more your life will become magical, because it gives you more power to create and manifest all the things that you want in your life. If you keep walking around playing the prisoner or the victim in this world…well that’s exactly what you are going to remain. We do our best to encourage you at any given opportunity to exercise your free will. You can call us your free will cheerleaders! Give us an F, give us an R, give us an E, give us another E, give us a W, give us an I, give us an L, give us another L!!! What does it spell? FREE WILL! When do we want you to have it? ALL THE TIME!!! So, as your biggest fans and cheerleaders, we would really love for you to not only just embrace your free will, we would really love for you to become the creators that you already are. You wouldn’t have a want or need to come and stay in our realm if you made your own realm exactly how you want it. Please take the time and carefully imagine what it is you would like to manifest in your life right now. What do you really really want at this time? Pick one thing and focus all of your imagination into it. Dream it up and dream it big. Try to even imagine it with all your senses: touch, smell, taste, sound what it looks like. Imagine you are there experiencing your dream come true. What does it feel like? Is it blissful? Is it the best feeling in the world? If it isn’t then we suggest you go back to drawing board, and keep going through the process until you imagine something that makes you truly happy. This Spring is going to be quite magical, and we are very excited for all of you, especially those of you who are proactively dreaming up really great lives for yourselves right now. We would also like to say at this time, that you might not want to worry or focus on what other people are creating for themselves in their lives. The truth of the matter is that you might not like what you see, but this is what they want in their lives at this time. They are experiencing exactly what they want to be experience, even if they themselves can’t admit it at this time. Trust in the absolute perfection in everything at this moment. What’s important right now is what you want in your life. When you focus on other people and what they are doing, you are denying yourself some great opportunities by not meeting your own needs in that very moment. What is it that you want to create for yourself? What do you want? We are listening and we will help you materialize the things you want to create and manifest in your life. We love you so much and we hope one day you love yourselves as much as we do. You deserve the best of everything!